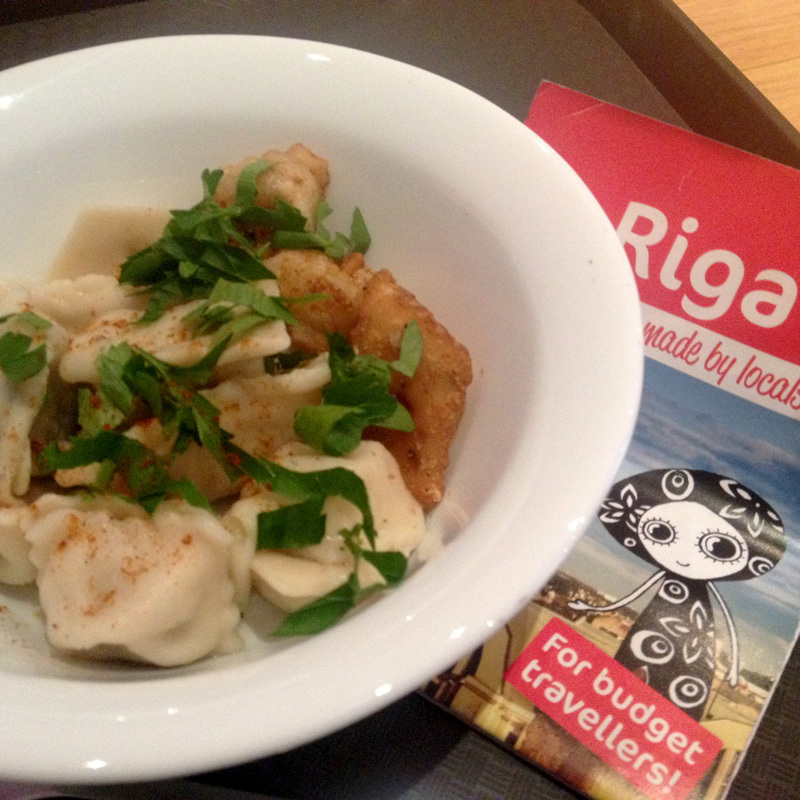 From Europe’s largest market to Russian dumplings – Riga has plenty of budget conscious options for all tastes – from gourmet to simple, local food. On a recent trip to Riga, these were amongst my highlights. 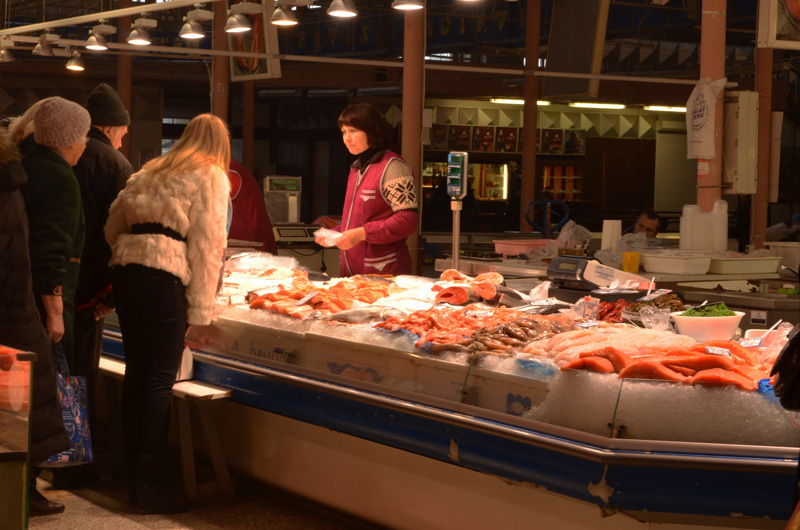 Niklav’s specialises in a mix of Latvian and European dishes. As I wandered into town, I spotted it had a weekday special of €5 for 2 and €7 for 3 courses – steal. 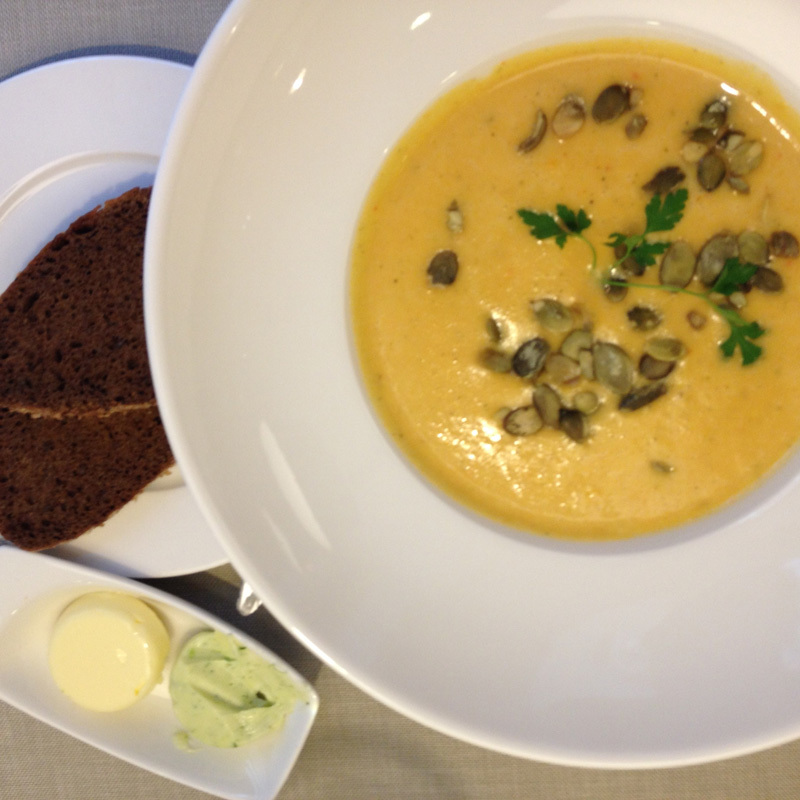 The starter, a simple vegetable soup with toasted pumpkin seeds was served with beautiful dark rye bread flavoured with caraway seeds accompanied by a dill butter. For main, chicken thighs with soy and honey served with sautéed potatoes. Simple but deliciously warming on a freezing February afternoon. 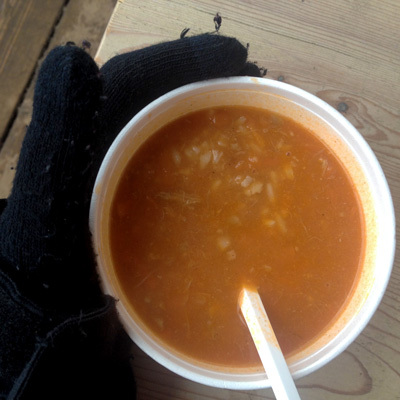 This is most likely a mid-week winter special, but the Latvian menu is still reasonably priced with a great selection of traditional dishes such as marinated herring and baked blood sausage. Pelmeni are Russian dumplings, made from flour and water and stuffed with meat (typically lamb, beef and pork) vegetables or cheese. This unassuming place (plus another branch in the Central Station) allows you to help yourself to 6 different types of dumplings, a soup and an array of sour creams and paprika, plus a glass of kefirs (buttermilk) to wash the lot down. Tourists with guidebooks sat side by side with businessmen in suits and fur-coated locals with bowls of steaming dumplings piled high. The price is based on pay per weight – I had a medium bowl for €2.50 – and despite being cheap, the meat in the dumplings was still delicate and moist. In the heart of the Old Town, descend down the stairs to Folkkklub Ala, to be greeted by friendly staff, a large choice of Latvian tipples (the honey beer converts even the most sceptical beer drinkers) and huge plates of decent priced, traditional dishes. I visited with a group from the hostel, the sole male devouring the 1kg pork knuckle which fell off the bone with ease. The girls shared Grandma’s meatballs – the richness offset by piquant sauerkraut and beetroot salad. I settled for the traditional Latvian grey peas, pan-fried with smoked bacon and onion cream sauce, served within a hefty loaf of hollowed out bread. Live music is often held later on in the evening, with Wednesday being Latvian Folk Dancing night. 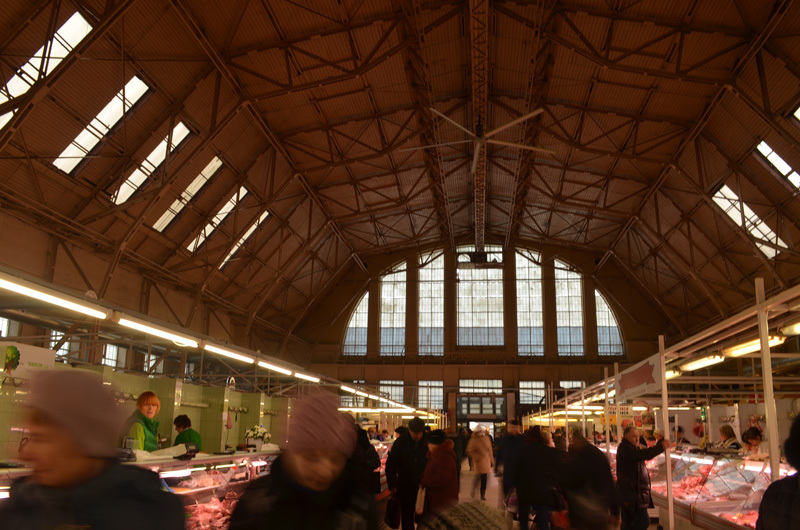 Just outside the Old Town, next to the bus station is Riga’s vast Central Market (one of the largest in Europe) housed in five former German Zeppelin hangars. Each hall has a theme from smoked meats to fresh fish, Latvian grown vegetables and great buckets of fresh cottage cheese and dark rye bread – the perfect place to pick up picnic ingredients in summer. Tucked between two of the halls is an Uzbek bakery, where queues of people waited for hot, fresh obi non, a thick flatbread from Uzbekistan for a mere 60 cent. I also tried a delicate filo pastry, stuffed with spinach and fresh cottage cheese for €1. 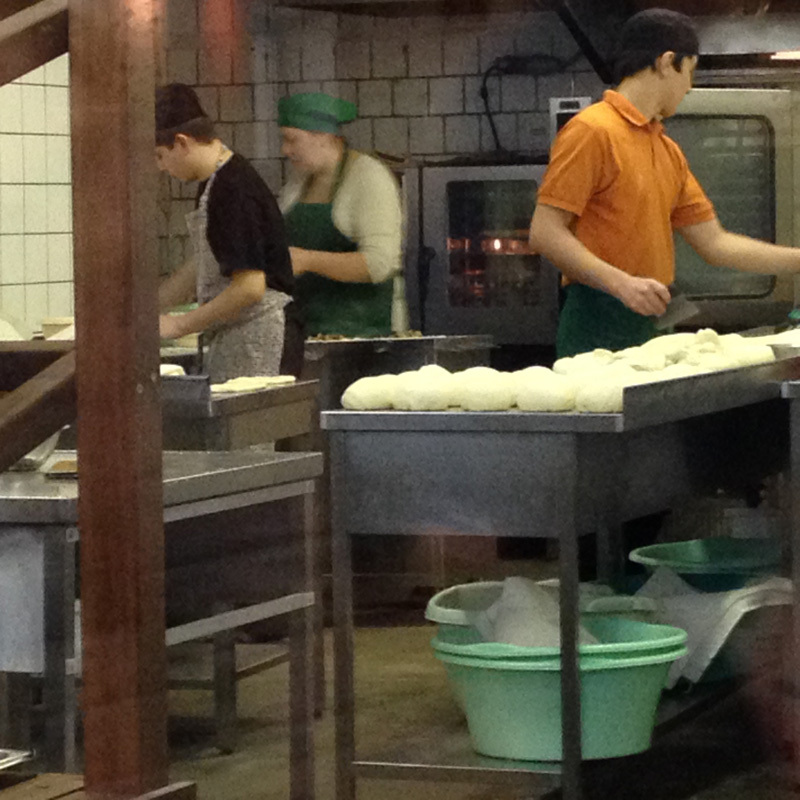 Part of a chain of restaurants across Riga, Lido provides a self-service hot and cold buffet selections – think Latvian pancakes, potato cakes, meat stews and sauerkraut. I opted for spicy sausages served with buckwheat, mash potatoes and a creamy carrot sauce which came to a reasonable €6 – a basic, filling feed. 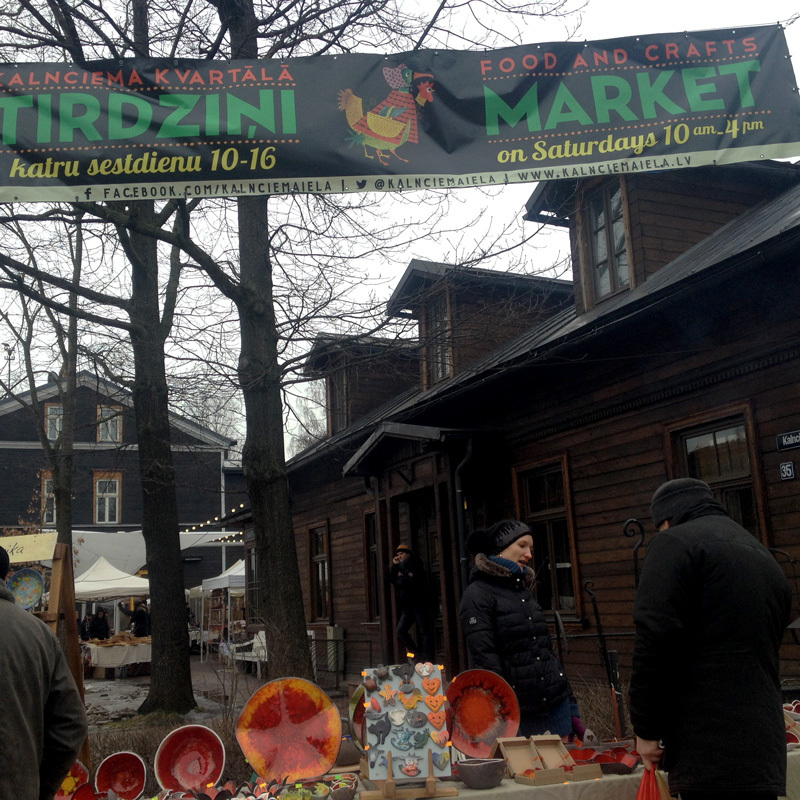 Held every Saturday from 10-4pm, Kalnciema is buzzing with locals seeking out artisan food from surrounding farmers and producers in Latvia – from honey to candied pumpkin, elk sausage to handmade cheeses flavoured with caraway seeds. 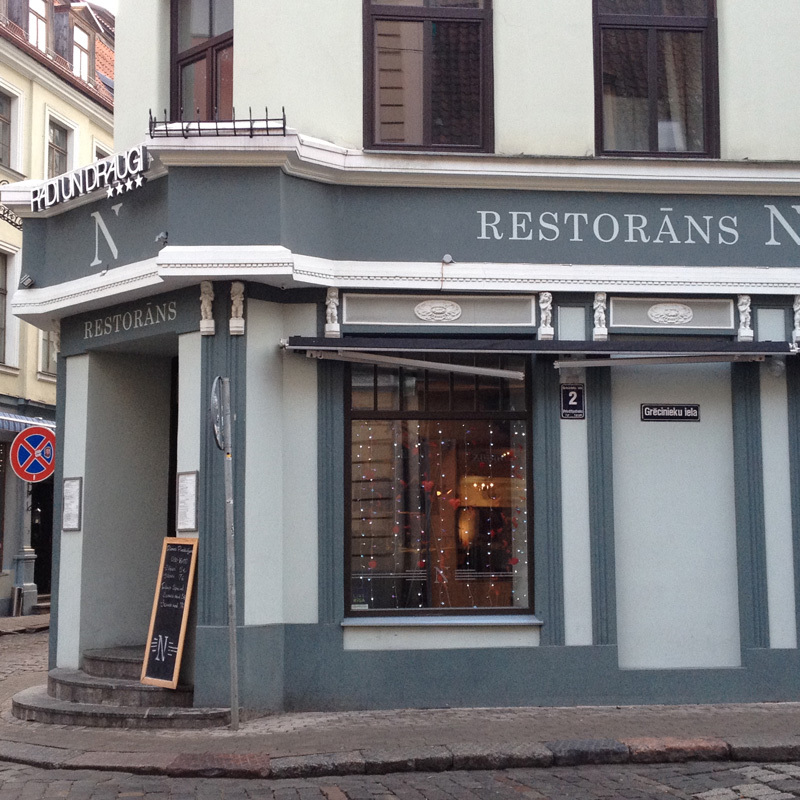 It’s a worthwhile venture to Riga’s left bank for a gourmet treat. A €2 stew pot of pork, rice and tomatoes with a hint of spice was a welcomed treat after making the visit on foot from the Old Town (about a 45min walk, trolley buses also stop next to the market). 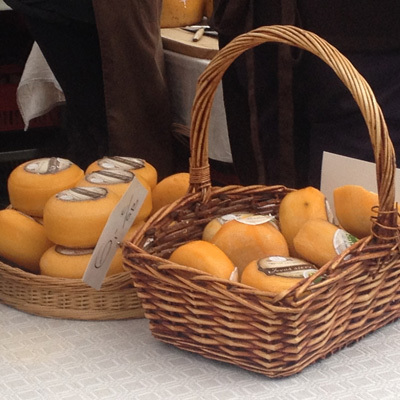 Local art and handicraft’s, brightly coloured ceramics and twisted jet black metal sculptures were also for sale. 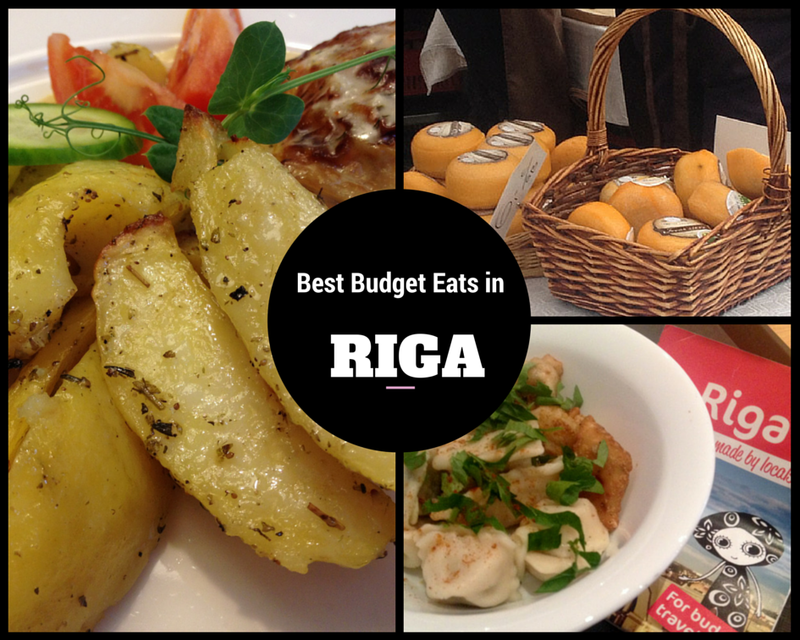 Do you know any hidden gems for budget eating in Riga? Share the love!